The turning industry, born from the watch industry, operated in the Arve valley in the eighteenth century. 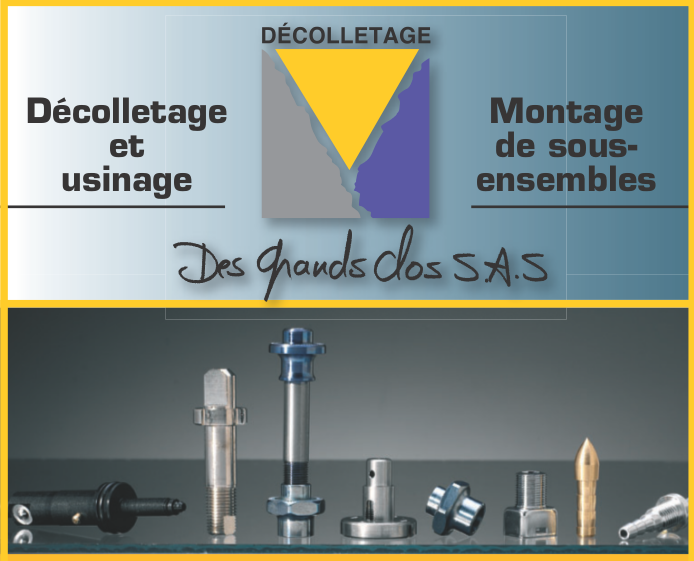 This activity was once used to release(“dégager”) the “collar”(“collet”) from the screws, using appropriate lathes: thus the French name for bar turning was born (“décolletage”). It was indeed in 1720 that a craftsman named Claude Ballaloud moved to St. Sigismond, a small mountain village in the Haute-Savoie (in 2009, the Tour de France passed through this quiet place in the blink of an eye). He trained a multitude of artisans and farmers as turners. At this time, one looked after the animals in summer and "made parts" in winter in the workshop next to the barn. Since then, turning has not ceased to evolve to reach a very advanced level of technology. At the end of the following century, companies that had specialised in bar turning for the watchmaking industry began to work for other branches of industry. Development was significantly quickened by the First World War, the French government having appealed to industries in Haute-Savoie to help out in providing armaments. This is the beginning of the growth of bar turning which has since continually expanded the range of its output. Bar turning developed in the early seventies, when it started to provide the automotive and electronics, electricity and appliances markets. In the 80s, the supply of parts to the automotive market did not stop growing, leading to the development of factories in the Arve valley. Lathes digitised thanks to computers, reducing changeover time of runs and production of increasingly sophisticated engineered parts. Turning is the machining of rotating parts with automatic lathes that run through cam systems (traditional bar turning) or numerical controls (NC bar turning). This form of machining uses metal bars, usually with a diameter close to the outside diameter of the finished product. It is also possible to machine extruded bars, the most common example being a hexagonal bar to make hex nuts. The removal of material is effected with the aid of carbide or high-speed steel tools. Of course, during the turning there is a constant feed of cutting oil to cool and lubricate the tools. Originally, bar turning was about working small turned components, screws and bolts in particular. As a result of changes in the methods of metalworking and large scale production applications, turning has become an important branch of mechanics and machining shoe aim is to produce large runs of identically turned parts, machined from cylindrical or extruded-shaped bars, to a most advanced degree of completion. These machines are often referred to as automatic lathes or simply turning machines..
France is the world leader in bar turning, with a total of 905 French companies employing 19,000 employees and with a turnover in excess of 2 billion euros business. 65% of these businesses are located in Haute-Savoie, more specifically in the Arve valley and around Cluses. Many of the most common everyday items are made using bar turning, such as screws, bolts, pins, watch arbors, pistons, gears, bicycle wheel axles ... are components manufactured exclusively by turning.